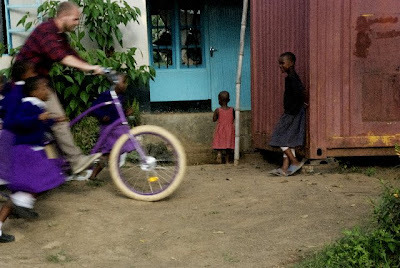 As I reported a while back, my Yahoo Purple Pedals bicycle went on an adventure to Tanzania. Henrik from Baisikeli took the purple beast with him on a trip to visit some of the workshops that Baisikeli send Danish bicycles to and to meet a container shipment of bicycles. 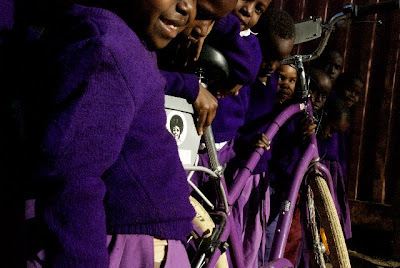 Schoolchildren with the Yahoo bike. Nice to see the Cykelhjelm.org sticker out travelling, too. Battling The Culture of Fear around the world. You can follow the bike's journey on the Flickr photostream. The bike, when in motion, takes a photo every minute and geotags it. There are sometimes a series of black photos, if it's night, so be sure to scroll down and go to the next page. 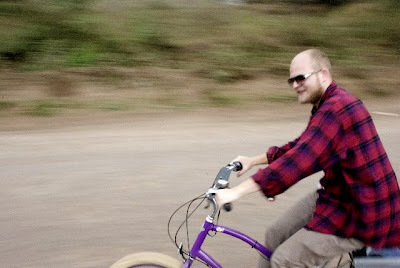 Henrik on the purple bike. There are wonderful street photos from life in Arusha, where Henrik is based. And loads of bicycles. 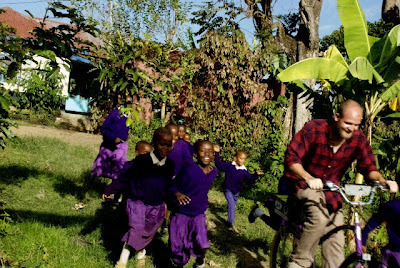 Baisikeli works differently than many other bicycle charities. In fact, they aren't even a charity. They sell the Danish bicycles at local market prices to the workshops, who fix up the bikes and convert many of them to ambulance bikes, water bikes and other forms of cargo bikes. They then sell them to the local population at local prices, thereby creating a sustainable business circle. In order to finance the shipment of Danish bikes, Baisikeli rents some of them out to tourists, leases them to students and runs a corporate bike programme. If you are in Copenhagen and you have a bike that you don't need anymore, you're always welcome to take the bike down to Baisikeli in the Nansensgade neighbourhood. Tursensgade 10, to be exact.